It's the latest craze - popping boba! As the new addition to our Tapioca family here at Boba Tea Direct, these translucent gummy ball contains flavored juices in the center which "pops" and oozes with every bite. It's sure to give your mouth and tongue an unforgettable sensation. Never tried this boba innovation before? It'll give your drinks or dessert a fresh look and style. 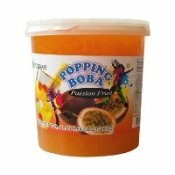 Popping boba is ideal with cold drinks, shaved ice, ice cream, and frozen yogurt. Or, you can also add them to your pudding jelly or cake for a unique presentation. Best of all, there's no cooking required. They are ready to serve! This item has a shelf life of 9-12 months. After opening, we recommend storing popping boba in the refrigerator for freshness. *CASE* of four 7-lbs containers. Shipping weight : 30 lbs.